Christmas is coming, people! What better way to get in the mood than booking a trip to one of the Europe’s many magical Christmas destinations? Take a peek at our top 5 Christmas destinations and start getting excited! Prague is perhaps unrivalled in terms of Christmas atmosphere. The main markets can be found in Old Town Square and Wenceslas Square, just a 5-minute walk from one another. Both markets are jam-packed with wooden huts selling hand-made wares, from wooden toys to scented candles. School children flock from all over the country to dress in traditional costumes and sing Christmas Carols. 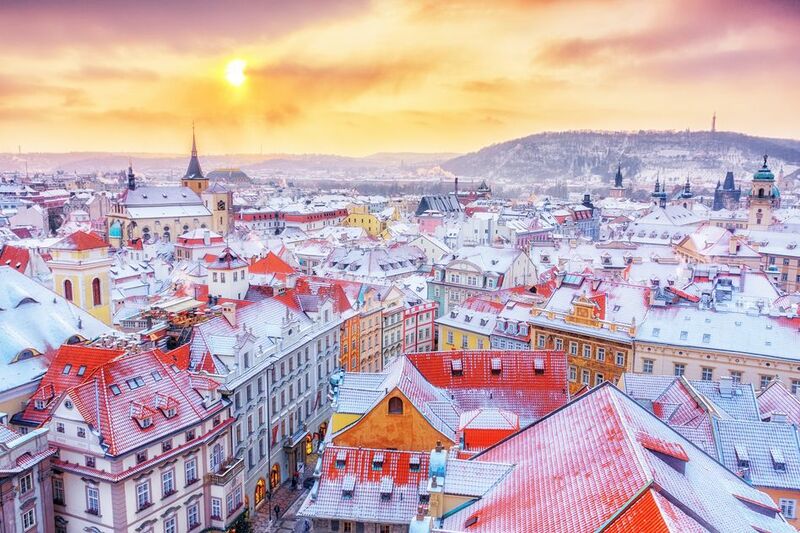 The rich aroma of traditional Czech food fills the air, as large roast hams are roasted on spits, and hot sugared pastries (‘Tredelík’) are prepared on the spot. Wash your treat of choice down with one (or two!) of the world-famous Czech lagers (Pilsner, Staropramen or Budvar) or the legendary mulled wine (svařené víno). For the best nativity scene, head to Old Town, where you’ll find an elaborate Bethlehem scene depicting the usual suspects; Mary, Joseph, baby Jesus, and the Three Kings, all in a wooden stable. There are even live animals which the kids (and adults!) can stroke. Both squares have Christmas trees, but the one in Old Town is second-to-none. Carefully chosen from a forest in Central Bohemia then hauled all the way to the city, it is then draped in all manner of multi-coloured lighting. Check out these apartments in Prague. This Narnia-esque winter wonderland, peppered with snow-capped trees, is the official home of Father Christmas, and a sure place to find the Christmas spirit. You’ll find the big man himself in Rovaniemi, where you can visit him for free (although photos cost). This is also the starting point for the majority of activities. Snow mobile rides, dog sledging, cross country skiing, and even reindeer rides are all available from here. After an exhilarating day in the snow, head to one of the of the gondola saunas and soak up the landscape from the comfort of the warm, bubbling water. Stay in one of the stunning ice hotels, or cosy log cabins! Getting there is surprisingly easy, with regular flights from Helsinki to both Rovaniemi and Kittila. 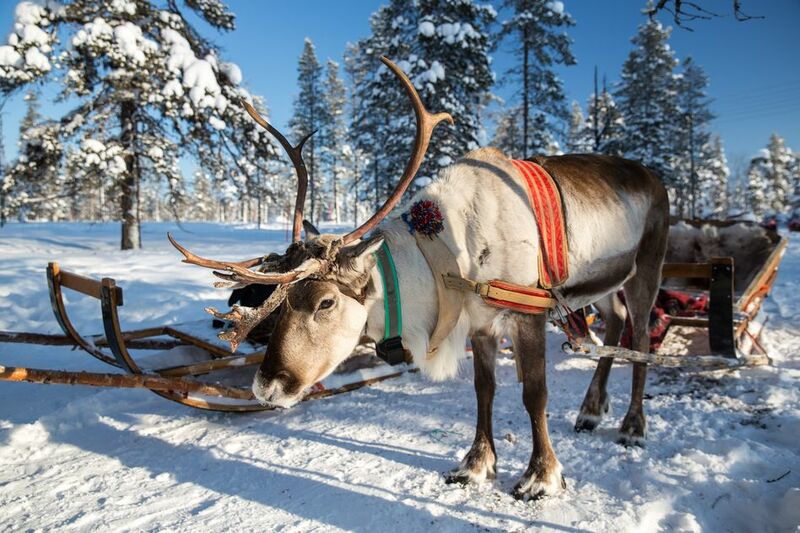 Check out these cabins and cottages in Lapland. The spiritual home of the Christmas market experience. 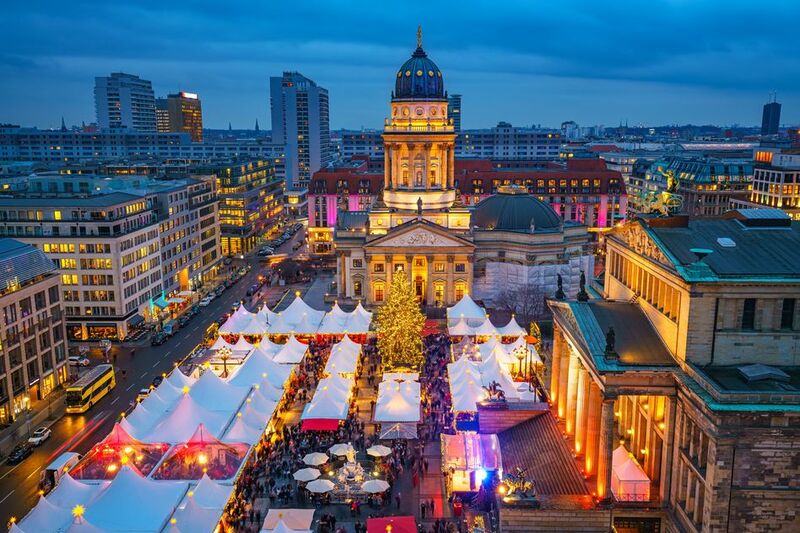 Most European cities tend to have one or two Christmas markets, but Berlin isn’t most European cities. Come at peak Christmas fever, and you will find no less than 80 Christmas markets dotted around the city! One you absolutely can’t afford to miss out on is the legendary Berliner Weihnachtsze, home to a 600-meter squared ice rink and the High Ferris Wheel, which offers spectacular views of the city. For the most special Christmas atmosphere, head to the Alexanderplatz Market, easily identifiable by the ginormous pyramid made up of thousands of lights. Wander around the quaint wooden stalls selling Christmassy wares, and warm your soul with a hot cup of Gluhwein. Check out these holiday houses in Berlin. This picturesque corner of France is close to both the Swiss and German borders, creating a unique melting pot of wonderful beer, wine and food. The sophistication of France combined with the German sense of “Gemütlichkeit” (their special word for cosiness) creates a Christmas atmosphere that is utterly unique. Strasbourg is the biggest city, and where you’ll find the lion share of Christmas markets, selling ornaments, mulled wine and delicious treats! The whole city loves Christmas, and even gets into fancy dress to celebrate! For the ultimate Christmas aesthetic, go to Colmar, the second-biggest city. 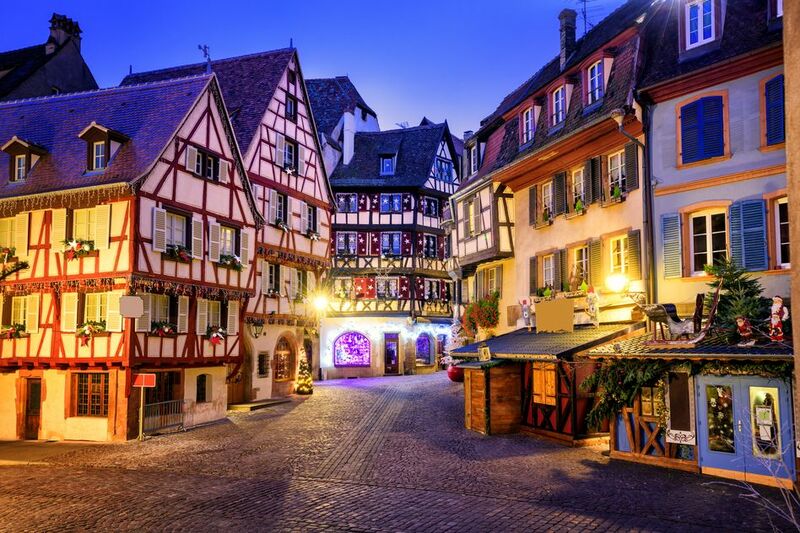 The colourful, half-timbered houses give the impression you are walking around in a 3d postcard. But don’t limit yourself to the cities! The numerous villages throughout the region all have their own unique Christmas markets, and, with Alsace being a wine region, their own wineries! We recommend flying into Basel and driving so you can stop off at some villages on the way. Check out these holiday villas in Alsace. This mountainous region in Austria is indescribably beautiful in Winter. 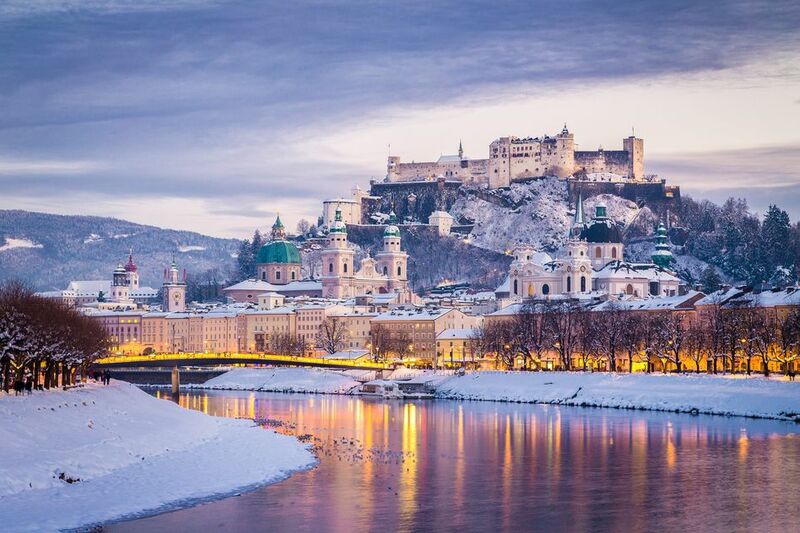 Snow-capped mountains provide the backdrop for the many villages chock-full of beautiful log cabins, as well as the world-heritage listed city of Salzburg itself. The main market takes place in the heart of Salzburg, and is one of the world’s oldest Advent markets on the planet, dating back to the 15th century! It attracts countless visitors every year, locals and tourists alike. The specially designed lighting gives the illusion of stars in the sky above the traditional wooden huts. As well as the one hundred or so market stands, there are daily events, including parades, Christmas story readings, choral concerts, and more! It is truly a hub of Christmas activity like no other on earth. Check out these apartments in Salzburg. Got any suggestions for a Christmas adventure? Comment below!